ELLA HAD BIG UMBRELLAS AND SMALL UMBRELLAS. SHE HAD THEM IN EVERY COLOR, EVEN JELLYBEAN GREEN. For Ella's friends and family, birthdays are a no-brainer. Each celebration brings her umbrellas in unusual shades and bumbershoots with bows, and she loves them all. Soon her collection crowds her own room and begins to spill out into the rest of the house. The one day her mom gives Ella an umbrella ultimatum. Her favorite aunt is coming to visit, and plans are for Aunt Stella to bunk with Ella. 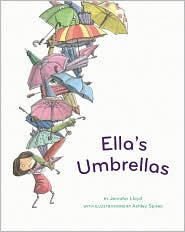 But Ella's rainbow collection is stashed all over her upper bunk, her closet is all a-clutter with them, and there's no place for Aunt Stella among all of Ella's umbrellas. ELLA'S MOTHER WAS IN A TIZZY. "ELLA," SHE CRIED. "AUNT STELLA WILL HAVE NO PLACE TO HANG HER COAT. AUNT STELLA WILL HAVE NO PLACE TO PUT HER CLOTHES. AUNT STELLA WILL HAVE NO PLACE TO SLEEP!" Sadly, Ella gathers together her striped umbrellas, her polka-dotted umbrellas, her umbrellas with hearts, and all those which opened with a satisfying POP! Loading them into her wagon, she sets up for business on her front lawn with a teeny, tiny sign that reads FREE UMBRELLAS. Carefully setting aside her favorite robin's egg-blue umbrella to keep, Ella waits for a customer. But she soon learns an important business principle: no one really wants an umbrella--at any price--on a sunny day. Equipped with a slightly bigger sign, Ella heads downtown looking for people who perhaps need a parasol for the sun, but no one gives her beloved collection a second glance. Until--PITTER PATTER SPLASH--a sudden sprinkle turns into a torrential downpour, and Ella serendipitously finds her umbrellas a sudden hot commodity. Under her remaining and most beloved blue umbrella, Ella is splashing home when she suddenly sees her friend the postman, dripping and drenched by the deluge, his mailbag heavy and his usual cheery whistle squelched, slogging through the shower. IT WAS HARD, BUT ELLA KNEW WHAT TO DO. And what do you suppose Aunt Stella has for Ella when she arrives? Yes, a long, thin box that can contain only one thing, "the most beautiful umbrella Ella had ever seen." Jennifer Lloyd's Ella's Umbrellas (Simply Read Books, 2010) is a light-hearted antidote to April showers, illustrated fetchingly by artist Ashley Spires in sunny pastels that set off this story of an earnest little character who successfully copes with the perils of collecting, learning that there is such a thing as too much of a good thing and that sharing is better than hoarding.